Organized/sponsored crews like Konnarock who generally take on specific projects (typically requiring heavy construction–paid for with Federal dollars) are still attracting some younger folks–probably because the work is a “one-off” stint of 5 to 10 days. Highly valuable, fun, and essential to conducting the major, ongoing repairs a trail needs. However, the day to day maintenance and small projects (shelter repairs, signs, etc) are performed by by small crews or individual volunteers. Leaders of clubs (who organize and support these small crews) are also a key volunteer resource. Both of these groups are graying and numbers are diminishing (we are certainly seeing it in my own club). Getting younger volunteers interested in joining this “old boy’s club” can be difficult. Yes, sometimes it’s like working with your parents. The cultural differences between the generations is one hurdle, but another is simply that younger people in mid-career and/or with families may not think they have the time to commit to a “regular” AT job. Trail maintenance does need to take place reliably and regularly (2-4 times a season, depending on local conditions). We have addressed this issue by supporting “co-maintainers”, that is a group of people who share responsibility for a section, this seems to be having some success in syncing with busy families and life schedules. I would urge readers to check out their local club, go on a few work parties, get to know the other volunteers. It will take a few visits before they consider you a “regular”–it’s sort of like finding a new bar to hang out in. If you like the work and the people, let them know you would like to do more as your schedule permits. Consistency is almost as important as frequency. Don’t worry about skills, you will learn as you go. When you are ready, there is training for advanced skills like chainsaw work and rock rigging–if you want it. 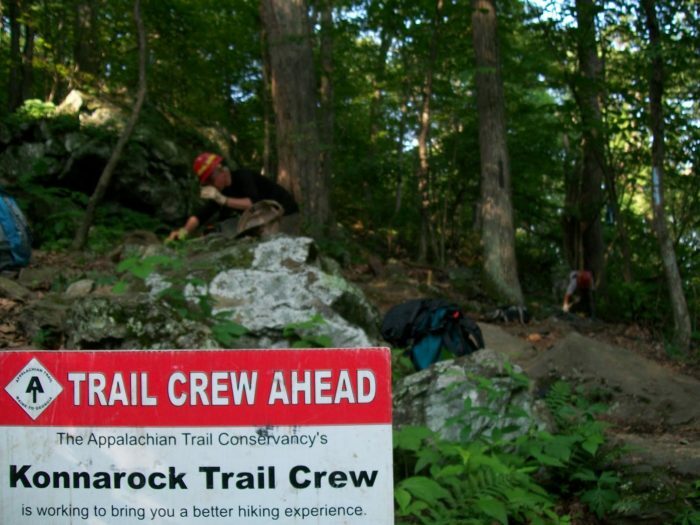 Caring for the AT is more than just clearing trail and painting blazes. Some clubs have work off-trail on the boundary of federal lands, others monitor rare plants, more run the club’s social media efforts or maintain tools and gear. There really is work for lots of different interests. Thanks for the cogent comments, Cosmo. Makes me wonder who you are in “real life”! Awesome article, Pony! Thanks for writing this and all the sweat and muscle-power you have contributed too. 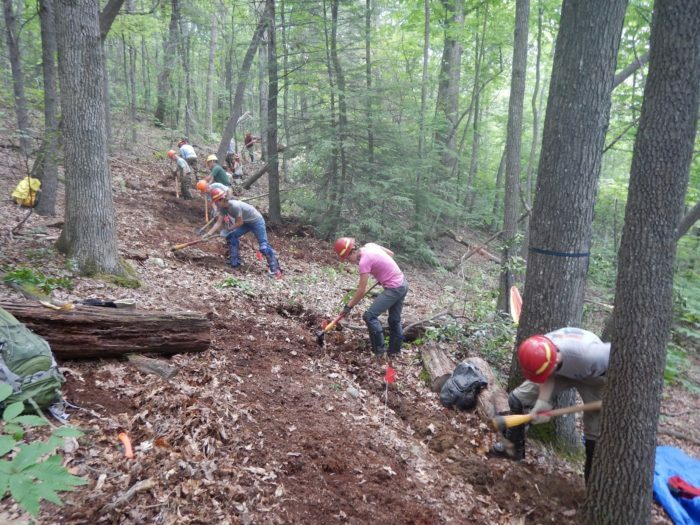 Joining a trail crew and working with a local trail club are different ways to give back–you can choose one or do both! 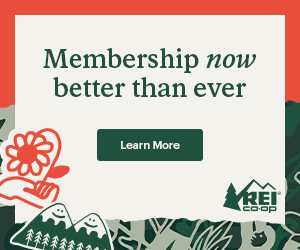 And if you’re not social, you may be given the opportunity to maintain your very own section of the A.T. by a local trail club with just a little training or participation in a few work trips. All can be incredibly rewarding in their own way. And when you’re working on the trail and a passing hiker thanks you, there’s no better feeling. I like that analogy, too. I had a comment from a friend who notes how difficult it is for younger people in the “gig” economy to find time for volunteering. While I certainly sympathize with that, I also think that what Kim Peters is saying in this piece about giving even one day a year should be doable for almost anyone. And I just think all of us who love the AT (and other trails) should think of it as giving back, rather than a headache or obstacle. 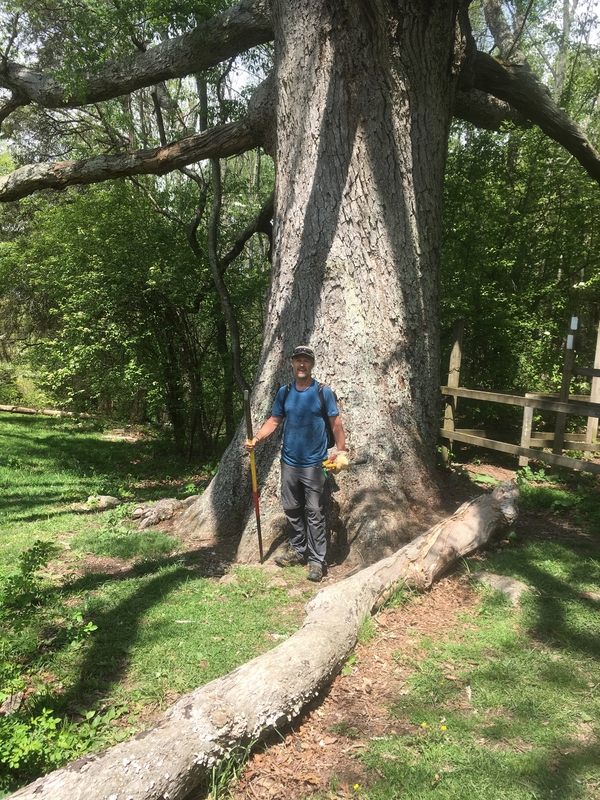 The AT gave to me, as did the countless thousands of volunteers who have kept it in shape since the 1920s, so I think giving up some of my time is only right! Lots of one-day or partial day volunteer opportunities are found with A.T. Clubs and with ATC at Appalachian trail.org/volunteer. Wonderful stories of your labor and love for the Trail in this piece, Clay! Awesome article, and it’s all right. We have to get younger people involved somehow. I’ve been disturbed for several years that too many young people don’t seem to have the same interest in the outdoors that my generation had. It’s even bothered me that some thru-hikers I’ve met don’t intend to volunteer afterward. 1. Better publicity about the clubs and what they do, particularly using the media that younger people favor. 2. Work schedules that are possible for people still in their jobs, which essentially means weekend worktrips. 3. Emphasizing the collegial atmosphere of Appalachian Trail work. My workmates are, in a sense, another family, and my trail work takes me away from worry about things I can’t do anything about. For instance, yesterday I spent nine hours improving drainage on a five-mile hiking trail. It was hot and tiring, but it was very rewarding, and one of the better things about it was I didn’t think about Donald Trump once. It shows me I can make a difference. While trying to recruit ‘new blood’–luring them in with stirring speeches about promises of rewarding feelings of accomplishment and contribution to something bigger than ourselves–is a good start, we who already have been drawn to trail maintenance have got to have faith that more people, much like ourselves, are out there and will eventually come along on their own to take up the cause. When we look inward and ask ourselves, “Why do WE do it”, I’d say that many, if not most of us, will answer that it is an inherent inborn desire to do something good to a trail that has done us so much good. Yes, busy lives and busy schedules get in the way of regular attendance on work crews but that doesn’t mean that there’s not a desire buried in the hearts of these busy people. Let them get the raising of their small children out of the way, like I did, and I think you’ll see them come out of society’s woodwork when they finally have the time and situation to allow them to join. I didn’t start doing trail maintenance till I was in my early 40’s, when my kids were grown and safely launched into their own lives…and I’ve been doing it ever since. Now I’ve got one of my granddaughters joining me from time to time to help me maintain my own adopted section of the AT. Nothing makes me prouder than one day, while watching the Blackalachian, who was filming his hike on a YouTube video, I recognized this exact section of trail where one day, earlier in the year, my granddaughter and I spent over an hour with hand saws and axes cutting a large blowdown off the trail, stacking the wood neatly on the downward side of the trail to shore it up against erosion. 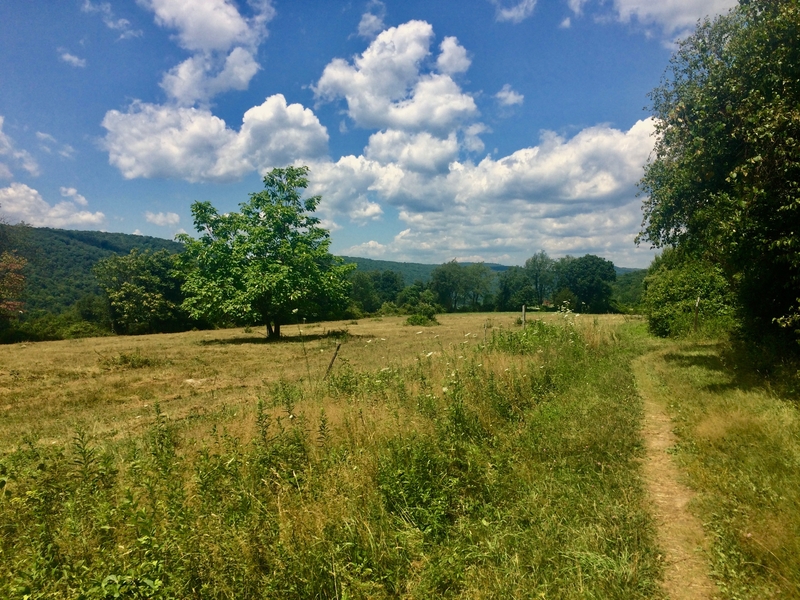 I was so proud that she was able to see our little part of the trail in his video and be able to demonstrate to her how our hard, sweaty hour of physical labor made one hikers journey a wee bit easier. Thank you for taking the time to write this excellent article and to bring awareness to this attrition of maintainers; a concern that I think will probably always be with us. All is not lost. To see that infusion of new blood, look no further than Bill Hodge’s Southern Appalachian Wilderness Stewards. Every year he brings in a hundred or more volunteers into this program. Many are young and eager to learn the way of the axe and crosscut saw along with basic trail maintenance and wilderness ethics. Last year’s newbies often become this year’s crew leaders and take that mojo back to their home clubs. This problem is affecting far more than the AT. The main reason is simple. There is a growing number of older people and a shrinking number of younger ones. This situation isn’t going to reverse in any hurry. Perhaps it will be necessary to reorganize things so the older folks work on the easier sections while the younger (and stronger) ones are concentrated in the harder to maintain parts. How about getting new immigrants interested in hiking and maintaining the trails? Putting an ancient power source (animals) to work hauling stones, etc.? I tried to volunteer with the Green Mountain Club. Had to pay to “join” the club to apply and got told that they didn’t have any openings after they got my money… Now I get asked at least a couple of times a month for more money. Totally turned me off from it. I wish I didn’t live so far away or I would.